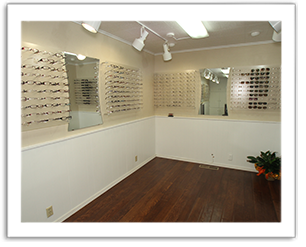 Dr. Dewald provides comprehensive eye exams to children and adults of all ages. Dr. Dewald evaluates the entire visual system and thoroughly examines the health of the eyes. The American Optometric Association recommends all children receive their first eye exam between 6 months and one year of age. Dr. Dewald provides these exams at NO CHARGE in an effort to rule out eye problems such as lazy eyes, crossed eyes, eye tracking problems, and ocular diseases. Dr. Dewald was expertly trained to diagnose, treat and manage many different ocular conditions such as dry eye, diabetic retinopathy, macular degeneration, cataracts, and glaucoma. Dr. Dewald is also very experienced at removing foreign objects from the eyes. Pre and post-operative care for ocular surgeries such as LASIK and cataract surgery are also services offered at Great Plains Vision Center. Dr. Dewald is a TLC Affiliate Doctor and has an excellent relationship with many cataract and retinal surgeons throughout Oklahoma. Dr. Dewald provides a wide array of contact lens services including daily disposable contacts, monthly contacts, contacts to correct astigmatism, bifocal contacts and colored contacts. Contact lens brands offered at Great Plains Vision Center include Biofinity, Air Optix, Acuvue Oasys, Proclear 1 day, Focus Dailies, and many others. Dr. Dewald also fits specialty contacts such as gas permeable (GP) contacts, bifocal GP contacts, contacts for keratoconus, and contacts for corneal transplants. In an effort to improve eye tracking and focusing skills, Dr. Dewald provides vision therapy services. Children and adults who suffer from conditions such as a lazy eye, crossed eyes, eye strain, headaches, and difficulty reading and concentrating may all benefit from vision therapy. Patients who have lost vision from ocular diseases such as macular degeneration can benefit from low vision services. Magnifiers, telescopes, reading aids and lifestyle tools can all help improve vision which has been lost to ocular disease or trauma.